Once again we’re late posting on the weekly photo challenge, but here’s our contribution to last week’s challenge of Beyond. 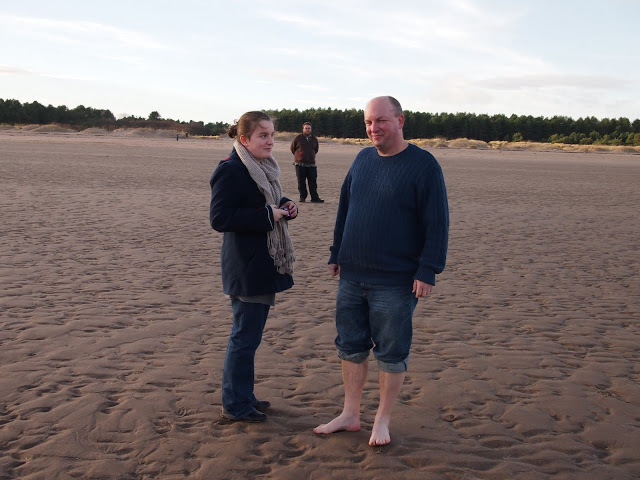 It was taken at Tentsmuir Beach , which is on the east coast of Scotland, just a few miles north of St. Andrews. I’d just been for a paddle (one of Tony’s Laws – whenever you’re at the seaside you must go for a paddle! ), hence the rolled up jeans. Next to me in the foreground is my daughter Devon, questioning my sanity,thinking did he really do that? 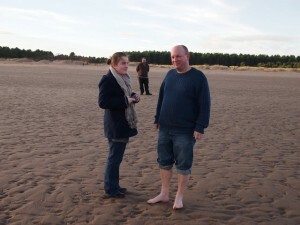 I have to say it was rather cold! In the background, or Beyond, is Tara‘s son, Sean, who is probably quite pleased that the United States gained it’s independence from the British!